Take intensity to the water. 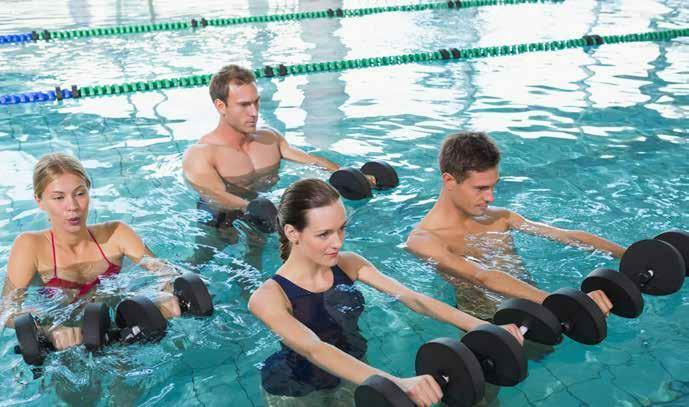 Water fitness has gotten a bad rap over the years because, in general, people think the workouts are "easy" and solely for older adults or the less fit. However, water is an untapped market for many, especially Generation Xers and Millennials. Why not take one of your higher-intensity classes into the pool and see just how different, fun and healing it can be&quest; This Tabata™-inspired workout will create new raving fans. This class calls for a chest-depth water line with the ability to reach a depth where participants can&apos;t touch down. As with any warm-up, start with smaller movements to acclimate the body. Consider water temperature: A good range is between 78 and 87 degrees. Regardless, encourage people to start moving once they get into the pool. Rotations. Plant feet on pool bottom, and gently rotate upper body from side to side. Start with hands on waist, and progress to arms floating freely. Encourage participants to become comfortable in the water. Jogging in place. While jogging, alternate between high knees and back kicks. Cue participants to engage core and keep rib cage lifted, shoulders back and down. Jumping jacks. Educate class on proper form: Keep arms under surface and allow feet to touch down on each jump &lpar;slowly&rpar;. Water squat jumps. Lower to shoulder level and jump; float down. Teach the following drills in a Tabata style. Each exercise lasts only 4 minutes, segmented into eight intervals, each consisting of 20 seconds of high-intensity work, followed by 10 seconds of rest. Allow a full minute of rest between exercises. This allows the body to recover and is enough time for equipment changes. Wall kicks. Place hands on pool wall, arms straight, and flutter-kick legs. Range of motion is shallow. Wall dips. With palms flat on side deck of pool, pull up to waist height &lpar;facing wall&rpar;. Keep shoulders down and do triceps dips while keeping torso off wall &lpar;core engaged&rpar;. Water plank. Get into plank position in middle of pool, holding body stable. Using pool noodle helps with stability, while sculling is more challenging. Progression: Add mountain climbers or pushups. Jump knee tucks. Jump legs up, and scull hands to keep knees in tuck position. The goal: Hold jump a few seconds before putting feet down and repeating. Noodle jumps. Hold noodle under water in "U" shape, hands on each end. Jump back and forth through noodle, keeping it submerged during each jump. Hot potato. Partner up participants and give each pair a medicine ball. While treading water, partners toss ball back and forth as quickly as possible. Weighted treading. Stay within arm&apos;s reach of wall for rest period. Hug weight plate to chest while doing flutter kicks &lpar;similar to wall kicks&rpar;. Stronger kicks ensure head stays above water. Noodle squats. From standing position, keep feet balanced on noodle. Bend knees and allow noodle to guide body into squatting position, then straighten legs again. Do one leg at a time for variation. Progression: Hold onto medicine ball. Bicycle. Sit on noodle as if sitting on bike. Cycle legs quickly while sculling for balance. Runners lunge: Place one foot on step or ladder while other foot is on floor. Gently sink into supporting leg and lunge forward. Calf stretch: Place hands on wall for stability, one foot near wall &lpar;bent knee&rpar;, other foot in lunge. Push through back heel. Quadriceps stretch: Using wall for support, bend knee and hold foot behind you, pressing it into hand for extra emphasis. Lower back: Lean back against wall, bring one knee into chest, and hold. Repeat, opposite leg. Upper body: With back against wall and feet resting comfortably on pool bottom, clasp hands and stretch in front of body. Reach hands overhead. Reach one arm across chest, holding it with opposite hand to stretch shoulders. Repeat, opposite side. Place hand on wall and turn body away &lpar;chest stretch&rpar;. Repeat, opposite side. Side stretch: Place one hand on wall and reach outer arm up and over toward wall for side stretch. Repeat, opposite side. Relax&excl; Lie supine in water and let go. Appreciate the aquatic environment.